1. the medieval forerunner of chemistry, based on the supposed transformation of matter. 2. a seemingly magical process of transformation, creation, or combination. Although the practice of alchemy yielded many important discoveries, early chemists in the Middle Ages eventually gave up on turning lead into gold. But there’s another type of alchemical process that doesn’t involve chemistry. It’s the ability to transform painful circumstances into something beneficial. It’s being able to find the silver lining in the dark cloud, or perceiving the light at the end of the tunnel. I like the quote that says ‘in life you will meet two kinds of people; ones that build you up and ones that tear you down, but in the end you will thank them both.’ I always try to see the positive in situations and what I learned from situations even if they hurt me. What I learned from [my ex] was how to save myself and that I’m a strong and beautiful woman who did last more than an hour without him and lasted way more than a day in college, and that I have always been everything that he said I wasn’t. In an odd and unexpected way I thank him for teaching me very powerful things about myself. That’s a profound way to flip the story and pull the life lessons – or the gold, if we’re being alchemists here – out of difficult circumstances. What we want for all of our scholarship recipients is to lead a full and triumphant life free of abuse. This requires a change in thinking – a mental shift, from victim, to survivor. Ultimately we’d love to see our recipients become “thrivers” – women who are thriving, in spite of, or even as a result of, their pasts. There’s a choice involved here, whether it’s conscious or unconscious. Transformation doesn’t necessarily happen by accident. This survivor found the lessons in her struggle that made her stronger and better. But the truth is that this story could have gone down the road of victim, where everything is bleak and hopeless. 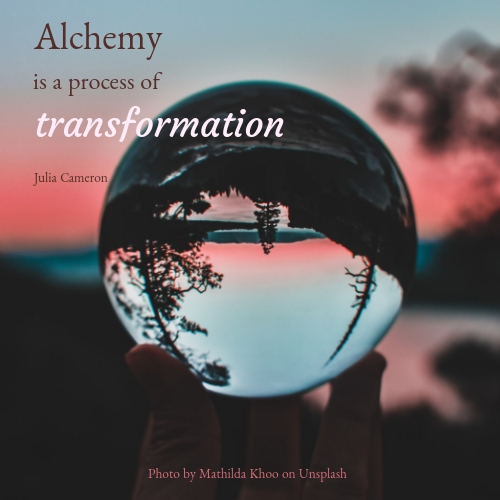 The mysterious combination of qualities that enables someone to make that switch, to choose the path of transformation: that’s alchemy. “My heart is afraid it will have to suffer,” the boy told the alchemist one night as they looked up at the moonless sky. “Tell your heart that the fear of suffering is worse than the suffering itself, and no heart has ever suffered when it goes in search of its dreams.” Replied the alchemist. Lena Kay shares an extraordinary story and lays out Three Steps to Transform Your Life in her TEDx talk.